The company we know as Louis Vuitton was founded in 1854 by Louis Vuitton himself. He was born in Anchay in eastern France to a working class family. His mother was a milliner (hat maker) and his father was a farmer. They both tragically passed away before he was even a teenager and in the spring of 1835 when Louis was just 13 years old he decided to walk to Paris. The journey was 292 miles and took him two years, taking odd jobs along the way. He arrived when he was 16 years old to a city ripe for innovation in the middle of the Industrial Revolution. He became an apprentice for Monsieur Marechal, a successful box-maker at the time. He stayed there until he decided to open his eponymous shop in 1854. Trunk making was an enormous business in the nineteenth century. Whenever someone (generally a very wealthy person) would travel, they would take 60-80 trunks with them which were all custom made to their specific circumstances. Up until this point, most trunks had rounded tops which were well-adapted to horse-based travel since the top could help rain slide off. Vuitton was one of the first to capitalize on the modern needs of industrial society with a flat topped trunk that was easier to stack. His innovations extended to the materials as he made his trunks in a waxed canvas instead of leather in order to reduce the weight of the trunk itself as well as make it more waterproof. Trunk weight was a significant issue at the time -- though not necessarily to the patrons themselves since they likely had a large staff handling the trunks. Here is an ad from the exhibit that bragged that the trunk was “only” 26 kg/57 lbs when empty -- that’s the overweight bag limit by most airlines today. Louis Vuitton has continued the custom aspect of the business to this day. For the right price it seems like you can have nearly anything commissioned and made at the workshop in Asnières, France. The custom pieces were definitely the most fun part of the exhibit in New York. The selection included custom toiletries cases for Old Hollywood stars, luggage sets made for movies like Darjeeling Limited, wardrobe cases, and even oddly shaped tetris-like luggage made to fit in the nooks and crannies of a specific vehicle. One of my personal favorites was a library case made for the designer Yves Saint Laurent to travel with a small collection of books. 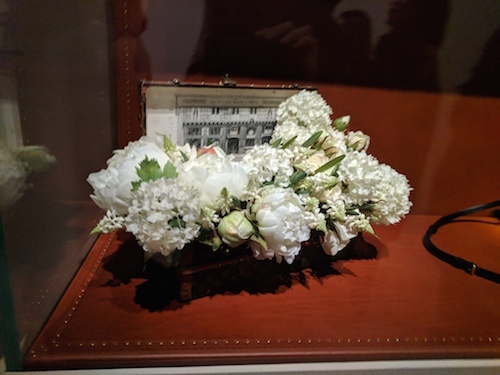 The best customers in the early twentieth century received a mini trunk filled with flowers -- something I’m surprised they don’t still do today! The exhibit also poked a little fun at themselves as they showed custom ice boxes and drink sets made for drinking while driving and newspaper clippings about murders that involved a Louis Vuitton trunk. Noticeably missing from the exhibit (though I can’t say I blame them?) was the company’s collaboration with the Nazis during WWII. Though some sources say the company conveniently “lost” all archives from wartime so they don’t seem to be acknowledging it at all. Cindy Sherman's Louis Vuitton collaboration: "Studio in a trunk"
One of the best rooms of the exhibit involved the collaborations the brand has done with other companies and artists. It included the Murakami print that was so ubiquitous in the early aughts; a trunk collaboration with artist Cindy Sherman, red trunks and skateboard cases with streetwear brand Supreme; and the latest masters prints with artist Jeff Koons. The exhibit concluded with a room dedicated to present day celebrities and primarily Marc Jacobs’s time as head of the brand (1997-2013). I didn’t realize Louis Vuitton’s ready-to-wear collections only began with Marc Jacobs in ‘97. It seems to only be a way to include the brand in fashion week since the clothing isn’t pushed very heavily by the company. Most companies only participate in fashion week as a marketing campaign anyway. All in all it was a wonderful exhibition that gave me new reason to appreciate the brand. I would highly recommend it if it travels to your city in the future.